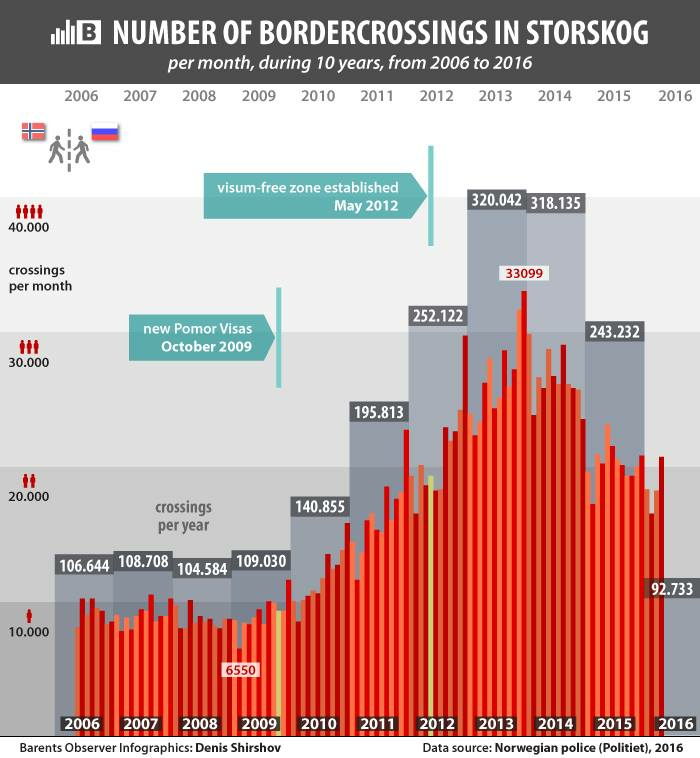 Including July, this year has seen more crossings at the Russian-Norwegian border than during entire 2009. Immigration officials at Norway’s Storskog checkpoint to Russia counted 20,104 border crossings in July, down 2 percent compared with the same month last year. The trend has been the same all first seven months. «Border traffic has decline with more than 8 percent so far this year,» says Stein Kristian Hansen, Head of Police at Storskog checkpoint. The decline continues slightly down from last year, but there are still many more people traveling across Europe’s northernmost land border than only a few years back. In July 2009, the number was 8,382, less than half of what was seen this year. Over the first seven months of 2016, 131,472 border crossings are counted. That is over 22,000 more than during entire 2009, statistics made available from the immigration officials reads. As shown in the Barents Observer’s infographics, travels between Norway and Russia peaked in 2013 and 2014. Traffic today are back on 2012 level. Two events during last decade caused a sharp increase in border crossings. In October 2009, Norway introduced the so-called Pomor-visas, making it possible for Russian citizens living in Murmansk- and Arkhangelsk Oblasts to get multiple entry Schengen visa to Norway without holding a prior invitation. Then, in May 2012 the two countries opened for visa-free travel within a 30-kilometers zone on each side of the border. Such visa-freedom, limited to people that have lived in the area for more than three years, was first time a Schengen member country introduced a regime for traveling without visa with Russia. The sharp decline in border traffic came with the collapse of the Russian ruble in November, December 2014 with a monthly decline of more than 10,000 border crossings. Many of the people driving from Murmansk, Nikel and Zapolyarny to neighboring Kirkenes were shoppers that suddenly saw a doubling in prices on Norwegian side of the border due to the currency exchange rate.